Shirts With Random Triangles: Tre Roberson is an ex-Indiana quarterback. In a statement released by a school, Roberson thanked the coaching staff of Hoosier head coach Kevin Wilson and his teammates. "I want to thank the coaching staff, my teammates and Indiana University for all of their support over the last three years," Roberson said. "My time in Bloomington will always hold a special place in my heart. I wish everyone at IU all the best as I move on to the next chapter in my life." 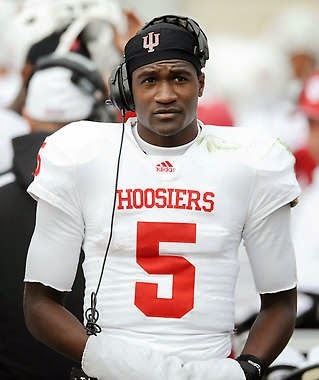 Roberson was starting QB at the start of the 2012 season, but suffered a broken leg in the second game of the season against UMass. He split time as starter in 2013 with Nate Sudfeld. Sudfeld had the better numbers last season, and is the favorite to win the starter's job this season.